«What is YOUR business why? Ask Lisa: How important is storytelling in copy for advertising and marketing? Q: How important is storytelling in copy for advertising and marketing? A: Storytelling is crucial. Purchasing decisions are made based on emotions (this could be need, want or connection — doesn’t matter – it’s the emotion behind the purchase that drives everything). People do business with people they know, like and trust. They buy products that make them feel good about the purchase. Storytelling helps build connection. Here’s more food for thought on storytelling via the Inc Magazine article This is Your Brain on Good Storytelling by Jessica Stillman. What really POPS for me from this article is the mention of empathy — I teach that this is VITAL piece of gaining trust and creating your marketing messages and it’s a two way street. No more poking at pain points and agitating. It’s important to engage people in a real and raw way to provoke critical thinking and engage emotions for good not for manipulation (which is often what the “Problem.Agitate.Solve” approach evokes not to mentions the perpetuation of buyer’s remorse). Storytelling is and will continue to be a vital piece of the marketing mix. I talk about how antiquated marketing approaches must change because poking at pain points is archaic and actually perpetuates buyers remorse. Hence my new “Challenge. Solution. Invitation.™” formula (that is not cookie cutter or paint by numbers) to help create marketing messages with integrity based on values and true service. Best off all it turns out that focusing on passion points strengthens connection and gets results. What’s YOUR story? Feel free to weigh in by leaving a reply on this blog post. 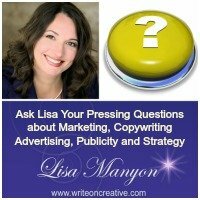 This entry was posted in Ask Lisa, Copywriting	on Sunday	March 12, 2017 at 12:56 pm. You can follow any responses to this entry through the RSS2.0 feed. You can also leave a response.